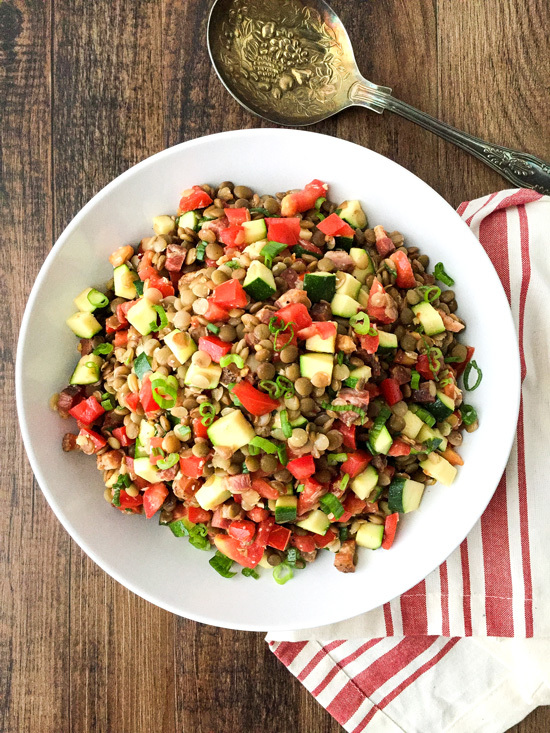 This Lentil Salad features an Italian vinaigrette dressing and is packed with tomatoes and zucchini. Salty pancetta is what takes this over the top with deliciousness. It’s great as a side dish or light main course! Today’s recipe is a super quick and easy dish that you can have for lunch or dinner. I really enjoy the Pancetta and Sprouted Lentil Salad that I came up with a while back, which features a nice spicy kick of jalapeño. If you haven’t tried that one yet, be sure to get that recipe, too. It’s so yummy and good for you! These lentil salad recipes are both great to have on hand if you need something healthy to pack for lunch at work. Just take it out and let it come to room temp before eating. My husband likes them cold straight from the fridge, but I really prefer them at room temperature. I really enjoy all of the flavor and textures going on in this Lentil Salad. You’ve got the mild earthy flavor of the lentils, saltiness of the pancetta and the crunch of the zucchini. If you’d like a little more of a sweeter flavor to the dressing, you could certainly add a bit more honey to it. The brand of sprouted lentils I buy is TruRoots. Natural Grocers, Kroger and a few other grocery stores carry them. Sometimes, you can score a good deal on them at Kroger when they have them on sale. You should be able to find them in the organic section of your Kroger. Or you could certainly use your own sprouted lentils if you are actually way more Martha Stewart-like than I am. Ha! If you can’t find sprouted lentils in your area, you can always try this with regular lentils. The cook time will be different, of course. Just cook the lentils according to package directions, then drain. 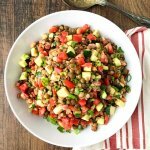 This Lentil Salad features an Italian vinaigrette dressing and is packed with tomatoes and zucchini. Pancetta adds a delicious salty flavor. It's great as a side dish or light main course! Cook the lentils according to package directions until tender, then drain and place into a large bowl. While the lentils cook, heat a 10-inch skillet over medium heat. Add the pancetta and let cook, stirring occasionally, until brown and crispy. Using a slotted spoon, place the pancetta onto a paper towel lined plate to let drain. In a small bowl, whisk together the olive oil, vinegar, dijon mustard, honey, garlic, oregano, crushed red pepper flakes and cheese. Add the pancetta and vegetables to the bowl with the lentils, pour the dressing in and gently toss to combine. Serve warm or at room temperature.